Bookmark – is a cloud-based AI-powered website builder. It looks innovative and modern, compared to standard systems of this type at first sight. Despite the niche competition, it impressed me with the balanced set of features this website builder offers. Founded in 2014 in Toronto by David Kosmayer, Bookmark has quickly gained popularity around the world due to its innovative approach to the web development process. The advanced AIDA tool combined with popular drag-and-drop technology the system uses to design unique websites helps cut down the time of website creation both for non-techies and web design professionals. The service is meant to create business websites, landing pages and online stores with responsive design. It’s hard to discuss the characteristics and applicability of the system right from the start. What exactly does it have to offer the potential audience? Does the service actually bring the automated website creation experience to the grinding masses? Let’s look for the answer to this question together. Simple and intuitive web design approach. Works great for landing pages, business websites and web stores. Bookmark supports Google and Facebook account registration. Once signed up for your account, you can start working on your website development by using the advanced AIDA assistant. Each step of the web creation process comes with useful tips. Apart from that, you can always browse the system to find FAQ info and lots of valuable articles/guidelines on website creation. This information is available in the “Help” section. The dashboard looks stylish and simple. The newbies can easily understand the purpose of the majority of settings through their titles. You can familiarize yourself with the dashboard in 10-15 minutes. Website creation with the help of ’artificial intelligence’ is one of the top trends today. Bookmark like Wix and some other website builders has recently presented its own virtual assistant. AIDA is available in the bottom right corner of the website builder to provide the 10 most important aspects of the service. What you need is to simply ask AIDA SHOW ME HOW and she will immediately do that. Just select your niche (750 of businesses are available), enter the name of your business and then AIDA will search the Web for your business. In most cases that I’ve tested, the AI has really found that business I’d pointed. After that, AIDA starts your website creation and you should just sit and watch the process. The AI fills your website with blocks (Bookmark calls them focuses) that suits the most, puts on sample content and customizes design colors. Voila! Now you should simply change the text and images into yours and the site is ready. Very easy. The entire website editing process is quite simple and intuitive as well. First time users will appreciate the availability of tips and prompts the system generates throughout the web design process. As soon as you click the “Edit Website” button, you will be offered a set of questions available in the pop up box that will help get the most out of your website development process. Thus, you’ll need to specify the type of the website you intend to launch, its style, fonts etc. 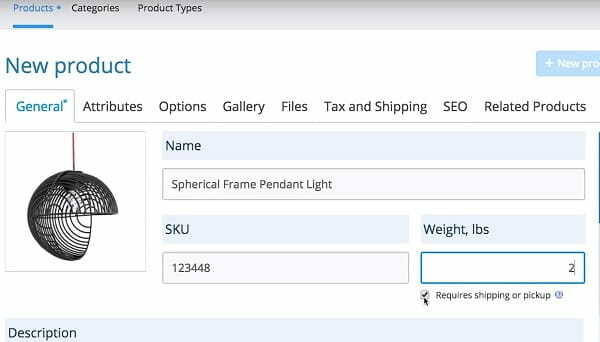 What’s more, you’ll have to add and customize website pages and sections, add/delete modules or adjust their positions on the page, change media and images, set up SEO parameters etc. As soon as you are done with that, you are welcome to publish your website. Just like the majority of quality website builders that come with visual editing options, Bookmark is intuitive and easy to understand. At the same time, it doesn’t look primitive. The system has everything (or almost everything) you need to build a nice website. It will surely appeal to the novices. Simple and intuitive web creation process. Bookmark working space involves two parts, namely the dashboard and the website editor. It is smartly organized, which contributes to the convenience of use. The dashboard provides access to all your websites, their statistics, an opportunity to get in touch with the tech support and the experts, system news, tutorials and notifications. You can create an unlimited number of free websites and switch between them any moment. Help – a section that grants access to the tech support and tutorials. For the multipage websites in the “Pages” menu, you can add new pages and specify their URL, SEO data (title, description, keywords), footer and header code. You can also safeguard access to them with the password. We have described the whole set of editing options available in Bookmark. It’s quite simple. You can easily get used to it, even though, the faults are apparent as well. We liked the advanced statistics collecting system of the website. 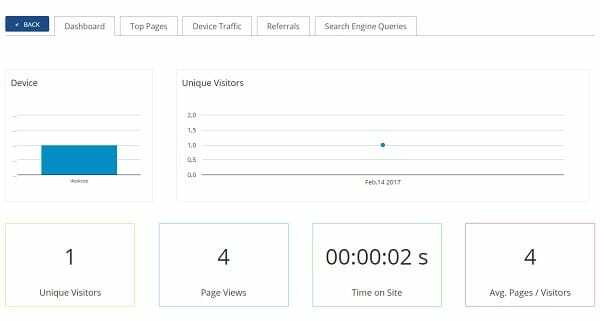 If you wish to get detailed information about your website performance and analyze the factors that have impact on it, access the dashboard of the system. This is the place, where you can see all the data about your website, including the number of page views and unique visitors, traffic amount, countries visitors come from, browsers they use, languages etc. You can select the period you are interested in, be it a week, a month, a year etc. Bookmark offers engaging E-learning courses for everyone, who wants to get extra knowledge and skills needed for successful business promotion. There is access to dozens of niche courses, all of which are free. The courses are developed by industry specialists and are really informative. The service stands out from the crowd by the original approach to the standard functionality realization. It is simple and even better of the niche competitors that come at similar cost. The website builder comes with a decent eCommerce engine that lets you sell online, in store or on social media. Bookmark allows creating a large online store, making it possible to add the unlimited number of products. The service lets you gain full control both of your web store and the products you plan to offer for sale. This is the place, where you can customize your website, issue coupon codes, choose between 40 payment options and real-time shipping integrations. Bookmark eCommerce currently supports 50 languages, while all the payments you make and credit card transactions are reliably protected with HTTPS protocol. With Bookmark, you can launch and manage your own blog. This is a surefire way to drive user attention, boost your authority, provide information about your business and the niche you specialize in. It’s up to you to update the blog any time of the day to keep your readers interested in what you publish. See also: How to start a professional blog. Bookmark lets you integrate a video background into your website to impress your visitors from the very first sight. You can pick and upload a unique video background to tell your brand story. If you don’t have the one, feel free to choose between hundreds of videos the website builder has in stock. All the videos are provided for free. The website builder makes it easy to connect your website to the required social media channels of your choice. 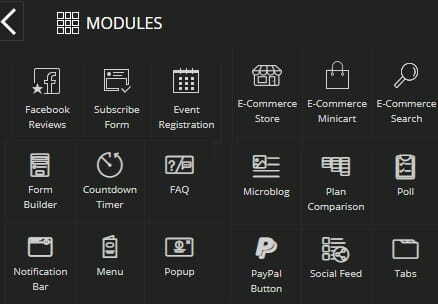 The system offers a “Social” module that lets you quickly add social media buttons that will link to the social media accounts. All in all, it is possible to integrate around 22 channels. Additionally, you can enable Facebook comments and reviews, if needed. The innovative Bookmark Agency Program helps you get your own website design agency website to grow your business. Making use of the powerful AIDA tool, you avail a perfect opportunity to start the project with minimum time and effort investment. AIDA will automatically do the job for you and it will also help you create websites for your clients. That’s a great idea that deserves the attention of users, who have ever dreamt of having a web design agency, but did not know, where to start. Why choose Bookmark Agency? The reasons are versatile. To start with, you will be able to get a full-featured responsive and mobile-friendly agency website in just a few minutes by choosing among 750 versatile business types. What’s more, you will have an opportunity to showcase multiple websites all in one place to let your clients pick the most suitable variants. The website builder will also handle all your project management and billing nuances, but this doesn’t mean that you won’t be able to manage payment issues yourself. You don’t have to be a proficient designer to start and manage a web design agency with Bookmark. Just like the system allows creating other project types with no coding needed, it lets you start a web design agency by using a convenient drag-and-drop editor. At the same time, users, who possess decent programming knowledge, may use it to integrate custom codes to their websites. This is a great way to make your project stand out from the crowd. The service has much to offer, including a collection of stock images and videos available in “My Drive” at no cost at all. Due to the SSL Security Certificate, your website will be protected from all kinds of threats, online frauds and scams. If there are any issues you are not sure about or you would like to get professional piece of advice regarding your design agency website, reliable customer support team is at your disposal any time of the day. Among the other advantages you will avail from the Bookmark Design Agency program, it makes sense to mention unlimited number of clients, earning potential and licences, unlimited disk storage space and bandwidth, opportunity to connect your own domain, no Bookmark branding displayed at your website, advanced analytics, video background integration option, 14-days money back guarantee regardless of the reasons etc. All in all, Bookmark Agency Program aims at leveraging the AI power to maximize user engagement and conversion rates. From now on, you can become a Bookmark Agent for just $99.95/year, getting your own revenue on a regular basis depending upon the terms of the program and billing option you will go for. That’s a really great offer! Versatility of Focus content blocks and Modules that act as widgets. Bookmark doesn’t have a standard template collection. Instead, it is AIDA that provides extensive websites choice. 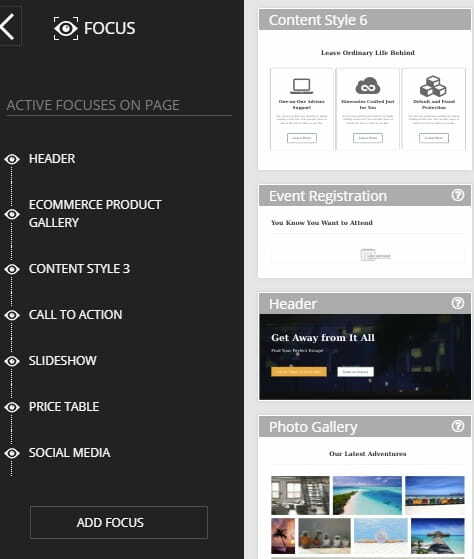 All the integrated themes are versatile: you won’t find two websites similar in structure. They are also responsive, which is a must-have feature for contemporary websites. AIDA makes it possible to select your business type to generate a website based on your needs. If you don’t like the project for some reason, you are welcome to ask AIDA to create a new one for you. You can repeat the action over and over again until you are completely satisfied with the result. Working with AIDA is simple, quick and engaging. The tool allows building a personalized mobile-ready website in around two minutes to help you establish reliable web presence. You can create as many subpages as you need for your project – the system does not set any limits or restrictions here. Apart from that, you can embed your own HTML code, if you possess the required knowledge and skills. Bookmark design customization settings are also versatile. Even though, AIDA takes care of the entire web development process and ensures impressive result, you can also edit your website design in the corresponding editor section. This is the place, where you can edit the style and background of your website as well as adjust general settings. This is very convenient for users, who wish to give their projects personalized look. See also: Bookmark real website examples. It is AIDA that creates the website for you. Bookmark intends to provide its users with maximum support to further empower them to offer high quality websites to their clients. You can get in touch with Bookmark customer support team any time of the day either by filling out a written form or through the live chat windows available on all the pages of the service. It’s also possible to contact the developers through the feedback form in the “Help” menu. If there are still any questions left, you can contact the system developers in the “Ask an Expert” section. This is how you will get access to the powerful social community of the website builder, where you can ask any system-related questions and get answers to them. The platform also makes it possible to watch lots of how-to videos to clearly understand how to use the system. You can use Bookmark for free with standard restrictions. The system does not allow connecting your own domain, creating over 10 pages, adding a store and removing its ad. Such plan can be chosen to explore and test the service only. Business ($24.99/mo), which involves the features mentioned above as well as an opportunity to create an online store with over 1000 product cards, acceptance of online PayPal payments, SSL connection, an option to sell on Ebay, Android and iOS store management app. The cost of Bookmark is moderate and it totally adheres to the quality and range of features offered. It is a nice choice to create professionally-looking and functional websites. Just like in the majority of website builders, a free plan lacks functionality because of the restrictions that are not compatible with launching a nice website. The cost-efficacy of using Bookmark depends on your own preferences and applicability. There are lots of niche competitors that charge the same prices for their services. The product stands out from the crowd due to the unusual presentation of standard features of WYSIWYG systems, advanced AIDA assistant and interface uniqueness. Generally, this is a decent system with reasonable pricing. It’s up to you to make the choice. Free plan to test the service. Two paid subscriptions to come up to various user requirements. Regardless of the appealing interface, Bookmark has a number of disadvantages. It makes sense to figure out what merits and demerits exactly the website builder has prior to realizing what you can expect from it in the long run. Let’s have a look at the list of pros and cons provided below. ✘ Small signature fonts in the visual editor. Ease of use for newcomers. Bookmark is an attractive full-featured website builder. It doesn’t offer any website templates, yet it can boast a powerful AIDA assistant. The tool makes it possible to launch responsive websites for multiple businesses by using the information provided. The process of launching a website doesn’t take longer than a couple of minutes, while the result is always impressive. The platform works best for creating different types of business websites. Online stores built with it are visually appealing and provide a broad range of eCommerce features. Is Bookmark worth its cost? It is. If it meets your web design needs, just buy a plan and start working. You won’t regret the result.